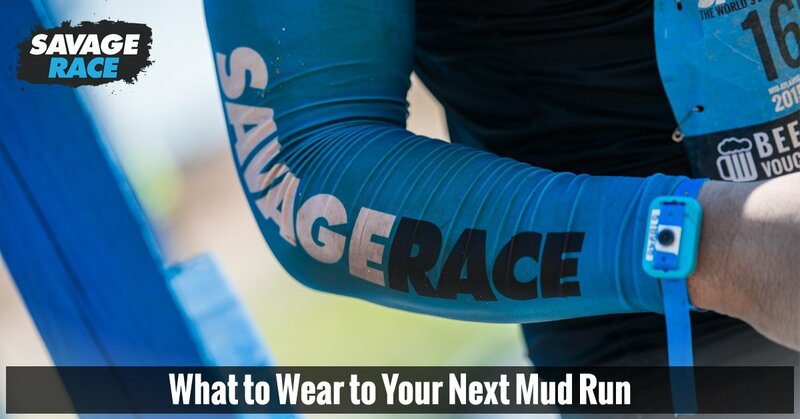 There are many options out there when it comes to moisture-wicking, compression, or other specialty clothing items for obstacle course racing. The most important thing to remember, however, is that cotton is always a poor choice for mud runs. Cotton absorbs mud and moisture which will likely cause chafing and be very uncomfortable. Cotton clothing also stretches out a lot when it gets wet, which can cause issues on the course. Choose athletic tees and tanks, sports bras, shorts/capris, etc. Anything that wicks moisture and will retain its shape when wet is a good choice for race clothing. Our friends over at MudGear have great options for socks that will keep your feet as comfortable as possible during your race. They offer a great selection of trail and compression socks specifically designed to withstand the harsh conditions of obstacle course races. We wrote about choosing shoes for your mud run here, but the three most important things to look for when choosing a mud run shoe are durability, traction, and drainage. Old tennis shoes can fall apart, slip and slide all over the place, and become extremely muddy and water-logged as you go through the course. We recommend wearing a quality shoe that has durable soles and uppers so they can withstand the rugged race terrain. Traction is also a key factor in keeping you safe on the course, so you’ll want to choose shoes with rubber cleats or bigger tread so you don’t slip in the mud. Finally, you want shoes that will drain water instead of absorb it. The last thing you need is heavy, soggy shoes a mile into your race! It’s easy to lose accessories in the mud and water out on the course, so leave everything you can at home or locked up in your car! We’re constantly finding keys, wallets, IDs, credit cards, hats, headbands, watches, fitness trackers, prescription glasses, sunglasses, necklaces, bracelets, rings, cameras, and more. We do our best to return lost items to participants, but it can be tough to recover and match up all lost items with their owners. If you’re determined to bring a camera or GoPro out on the course, be sure to put your contact info inside of the waterproof case. Even if you have a strap or tether, it’s likely that you’ll lose your item in the water or mud, so think hard before deciding to bring it with you! If you absolutely must bring prescription glasses onto the course, hold on tight when you go down the water slide at Colossus or jump into Davy Jones’ Locker! Wearing moisture-wicking clothes (including socks), finding durable shoes with good traction that drain well, and leaving all of your accessories at home will help you enjoy your time out on the course! (Of course, you could break all the rules and wear a Ninja Turtles costume, like this guy…) See you soon, Savages! For savage, I use fivefingers. They work the best for obstacles that need just that extra grip that your toes can provide. They also don’t come off very easily. What do you recommend for gloves?